Sister Cities International’s mission is the belief that cooperation across borders is more effective when we engage communities “one individual at a time.” In this spirit, the City of Issaquah Sister Cities Commission launched a unique cultural project which introduces the works of artists from Issaquah’s Sister Cities to residents by wrapping electrical utility boxes in prints of the paintings. This innovative project enables every resident, whether stuck in traffic or crossing the street, to engage with their Sister Cities locally. Artwork by Moroccan Artist Aziz Amrani, at the Intersection of 7th & Gilman. Title: Composition. Description: The painting features musical souls manifesting themselves and serving as an imprint on our energies, our colors, our emotions. In the summer of 2018, the City of Issaquah won the Sister Cities International 2018 Innovation Award for Arts and Culture for a city with a population size of 25,000 – 100,000. The awards competition, which is open to over 500 sister city programs nationwide, recognizes the accomplishments of outstanding Sister City programs that promote peace through mutual respect, understanding, and cooperation. 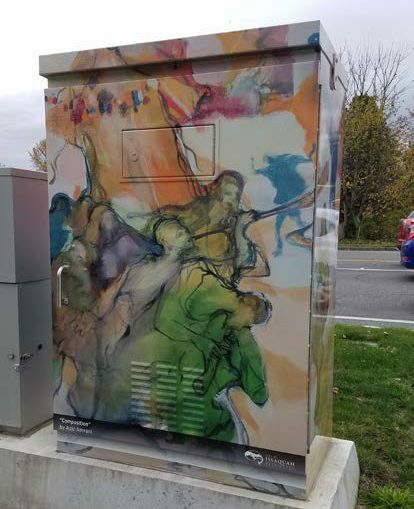 The City of Issaquah’s Utility Wrap Program, which launched in 2017, includes original artwork from Sister City artists in Chefchaouen, Morocco and Sunndal, Norway. 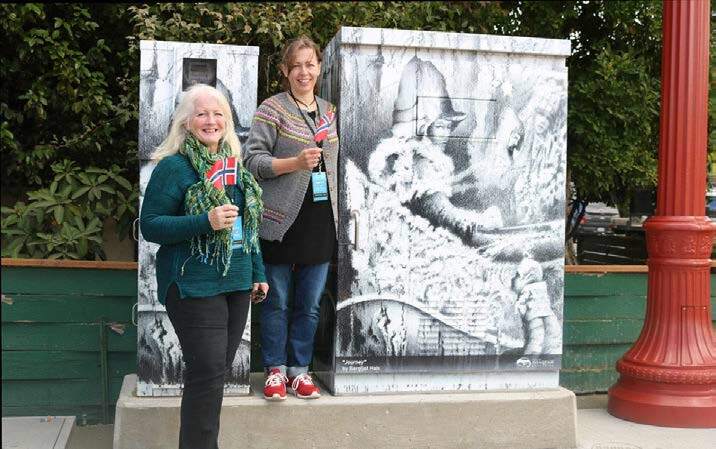 The transformation of the utility boxes from function to finesse changed the cultural landscape of the community while reinforcing the cultural exchange with each Sister City. The utility wrap program has significant impact on the community as well. Pedestrians and drivers enjoy these treasures daily, Issaquah’s outdoor art collection has grown, and the wraps beautify the community landscape. Additionally, over 150,000 people visit the art as part of the community’s annual Salmon Days Festival. Robin Kelley, Sister Cities Commission Chair (L) Bergljot Hals. Norwegian Artist (R). Utility wrap at the Intersection of 2nd and Sunset. Title: Journey. Description: The artist initially set out to make imprints from the wood of an old barn near her home, hoping to preserve its memory before it was demolished to make way for new development. She laid paper over the barn’s woodwork and hatched the sheets with graphite lead, then studied the imprint’s rings, cracks and hammer strokes, as persons, creatures and shapes appeared. She then worked to bring these new patterns forward with a lead-pencil, forging the truth of the wood with the fantasy of her imagination and the inspiration of Norwegian folklore. No Replies to "City Of Issaquah Wins SCI Award for Innovation in Arts and Culture"